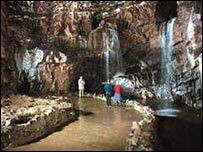 An operation is under way to rescue two experienced cavers cut off by flood waters underground at the Dan-yr-Ogof caves in the Swansea Valley. The men, in their 30s from south Wales and Gloucestershire, are in a dry area two miles from the end of the National Showcaves Centre for Wales. Divers, who are now kitted up to go back into the flooded area, are hoping water levels will now have fallen. The cavers have been trapped in the complex since Saturday. Rescuers who are in touch with the men said they were not in any danger. The two trapped men made contact with the outside world at 0615 GMT on Sunday and divers have been trying to get through a series of lakes to reach them since. 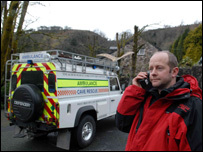 A team of about 15, including medical experts, from the West Brecon Cave Rescue team are at the scene of the caves in the Brecon Beacons. Gary Mitchell from the rescue team said they were currently assessing the water levels and that he hoped the men would be rescued in the next few hours. He said they were both experienced cavers and are not in any danger. "They have been underground now for 30 hours and are cold and tired but otherwise they appear to be OK," Mr Mitchell added. The men were in an area of a cave that is known to flood occasionally but they have access to a rescue cache of food, warm clothing, a stove and candles kept in the caves, he said. "So they're safe, dry and well and in reasonable spirits," Mr Mitchell said. "There is also a fixed telephone line system in this cave as well, so what they've managed to do is to tap into that telephone line system and they raised us on the surface at around 0615 this morning." The rescue teams say they are waiting for the water levels in the caves to drop before attempting an "assisted rescue". The cave complex at Dan-yr-Ogof, in the upper Swansea Valley, stretches for more than 10 miles underneath the Brecon Beacons.